OK, given the summer slowdown, I finally got around to creating a theoretical average position tracker for Ninjatrader. What is this you say? If you scalp, or scale into or out of positions, you’ll often have multiple entries and exits at different prices. Most DOM’s will show you average entry price, but scalp in and out a bit to improve basis etc., and that soon means little. If you are making multiple entries and exits throughout the day, you might be more interested in your theoretical average price, which could be well above/below the current price, vs the avg entry price of each position that the DOM typically gives you. That’s what this does. I know, you can calculate it in your head… But, if you are a math retard like myself, or if you simply have too much else going on whilst trying to make a living, this will help. This was built for Ninjatrader 8. It _may_ work with other versions (notably version 7), depending on if they changed the log format or not. I have not tested it. If it works, let me know in the comments below. I have only tested it using ES, but I expect it to work on any decimal pricing. Using it – Really simple. 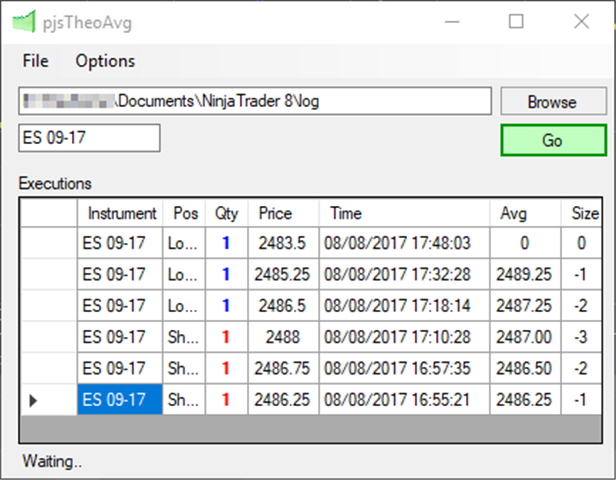 Configure the path to your Ninjatrader log folder (normally in my documents, ninjatrader 8, log) using the browse button, enter the instrument name in the box below (these settings are pre-populated with defaults already, just change them to suit your own setup), and click the ‘Go’ button. All trades from today for that instrument are reviewed and your averages are shown. The newest trades should be at the top of the list. Long, short, short, long – Does not matter. It should show you your average price for the day (based on what profit/loss you took along the way). There are some options on the menu entries. Now you’ve set the log folder, you can now enable ‘auto refresh’ option if you like. This should update the log in real-time, rather than you clicking the Go button to update. The app will remember the screen sizing and positioning so you can configure it as part of your trading desktop. Other settings should also be saved when you close the app. Not much. 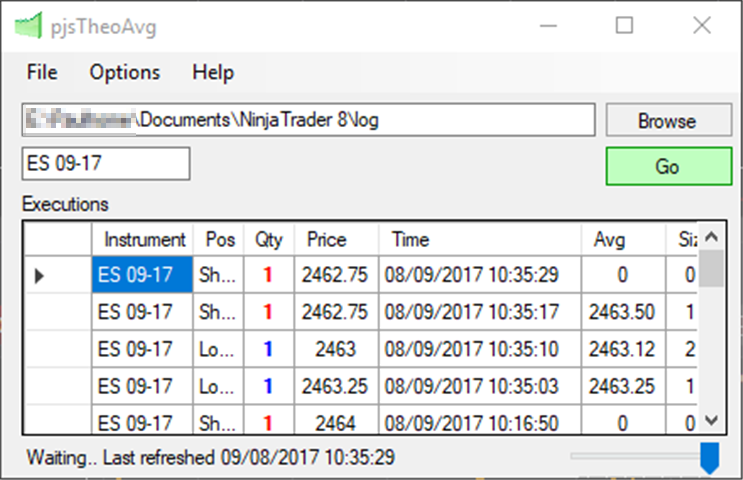 Windows, Ninjatrader (or it’s log files) and .NET 4.0 and you should be good to go. There is no install. Simply copy to a folder of your choice (I recommend one of it’s own – pjsTheoAvg is a nice name 🙂 ) and dbl-click the TheoAvg.exe to run. If you want to run multiple instruments, just copy to different folders and run multiple times. none yet, but there will be as I am actively using this, so this is a placeholder for when that happens. This is a first release. A very early one. Let me know if any issues in the comments below. 2017.08.12 – A few minor polishing items. Icon was not showing correctly in taskbar, when start on minimised was selected, sometimes app was missing from taskbar. Maybe a couple other minor tweaks. Also added right-click on mini window option to force refresh log file. Useful if started app before NT and it did not update real-time because of file issues etc. 2017-08-15 – Fixed a reported bug where the log path could not be changed. Sorry about that. Quite a biggie! Should be fixed in the latest download. Whoops! Bug – Sorry about that. Should be fixed now if you re-download. I tryed to import the indicator to the last NT8 versión and it says this Ninjascript was made for an older version…. Hi – That’s because this isn’t actually an indicator. It’s an executable you run outside of Ninjatrader. Don’t try and import it 🙂 Extract the contents somewhere and run it.